This post originally appeared on Women’s Running – as a part of a series of blogs I’m writing for them. You can see that link here. This post was so much fun to write and so well received that I thought I’d share it with y’all here. Runs go by much faster when you are running with a friend. When I run by myself, it can feel much much harder. Now I go on most of my runs with my friend Julie. During the long, polar vortex winter, I ran many of my miles with my buddy Mar. There is no way I would’ve made it through winter running without her. Running with friends gives you time to catch up. Between work, family, and life, we’re all busy. Running with a friend is an opportunity to spend time together while doing what you love. Running buddies turn into friends – fast. While Mar and I knew each other through social media, we did not meet in person until we both joined the same local marathon training program. We began going on all our long runs together. As the miles added up, our friendship deepened. We talked about everything while running. While I sometimes dreaded the workout, I always looked forward to the chance to spend a few hours with my friend. The same connection occurred with Julie. When Julie and I met for our first run, we had only exchanged a couple of emails. We met at a park in between our homes, set off for a few miles to test each other out — as run buddies and as friends. Our first run was in January, and we’ve since logged so many miles together. We enjoyed our time together so much that we started going to barre classes as well. 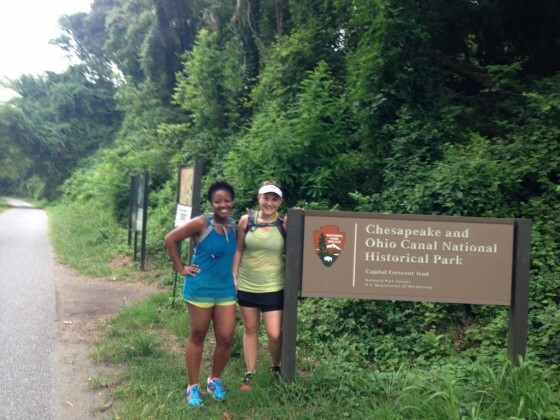 The friendships I’ve grown while running all around DC (and Maryland AND Virginia) are something I treasure. It can make you a stronger runner. I’ve always had issues with my breathing when I run. When I contemplated running with others, I didn’t know how I could possibly do it. I had enough trouble breathing easy while running. How could I possibly carry on a conversation? Well, it turns out I CAN carry on a conversation while running and in fact, I love it. I think being forced to control my breathing so that I can run and talk at the same time has helped to make me a stronger runner. It’s safer. This one is an easy no brainer. Early morning runs in the dark are MUCH safer with a buddy. Trail runs are MUCH safer with a buddy. Any run is just safer with a buddy. Do you like to run with a buddy? Why or why not? i’ve been doing a lot of solo running lately, but a good running buddy is invaluable! I do like running with friends, time flies! But lately I feel the need to run alone again. It helps to clear my mind. A good mix of running solo and running with friends works best for me. that sounds perfect! i’m about 90% with a buddy which i LOVE! I generally run with a group 2-3 times a week, but I have a few running buddies with whom I set up the occasional “run date” to change things up. It would take a special person with a similar schedule situation to mine in the same general area to have a dedicated run buddy, but one day the stars might align. i am so grateful to have a few awesome running buddies. they have made all the difference in my training! Running buddies really are the best! I’m not sure this journey would be as sustainable for me if I didn’t have friends to do races with and people I’ve met through training groups to do some training runs with. I like a mix of running with people and on my own. Yep! I 100% agree, Chaitali!! Agreed! Running with a buddy is always more enjoyable. Although solo runs are nice once and a while, runs go by so much quicker with a buddy! Great post, Courtney! I definitely think running with a buddy is safer, especially on trail runs, and the time flies! Great post; thanks for sharing your experience with us! Thanks Tara — running buddies are really really awesome! I love having a run buddy on my long runs, it makes everything go by so much faster. yes, 100% – it sometimes makes ALL the difference! Running buddies are the best! I love catching up with my old roommate! Nice post! I usually run one or two runs a week by myself but the one or two I can do with a friend is the best! Nice article! Mary Beth Jackson recently posted…My Summer series and a Personal Record! I currently run solo but I’ve run with friends a handful of times and it’s definitely fun! I don’t know if I prefer it though since I like running when I want, how long I want and at the speed I want. I think I would prefer a running buddy during the winter months, I hate hate HATE the cold and that might give me the extra push to get out and run. I have a hard time NOT running with my friends anymore. I get so lonely and they definitely help to keep pushing you when you want to stop! Great post! I trained for my first marathon almost entirely alone, but these days, I rarely run by myself. Running friends are the BEST!